The piano sounds great playing jazz, classical, modern, electronic or any other form of music. This is one reason why it has been popular in Australia since the first one arrived in 1790. Is Piano for Your Kids? 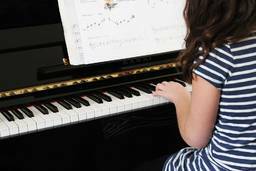 Research continues to show that piano lessons can help students obtain higher results in maths examines. Buying second-hand can be considerably cheaper, and a good used piano can sound better, play better, tune better, and keep its value better than new. However, it needs to be thoroughly tested. It is also possible to rent pianos. Depending on model and location, renting a piano may cost $70-110 a month. It is possible to teach yourself piano., However you child will progress much faster by enrolling them in a Piano class or in individual Piano lessons. To find a suitable academy. You will probably also need to buy music sheets. The Sydney International Piano Competition of Australia is held every four years and broadcast live throughout Australia, New Zealand and worldwide on the Internet. Piano is one of the most popular kids' activities!